[Knowing Your Maker] Who’s Battle, Yours or HIS? For sure you have read or heard about the story of David killing the giant, Goliath. If you think this is just a story in a book, well this is a true story and it happened during the time of King Saul as written in the Bible. What are the GOLIATHS (challenges/trials) you encounter in your life today? Goliath’s bronze coat was even heavier than me. He is like carrying another person. He must really be a one big giant man. Who can survive fighting him? Are your trials in life like that? When you think about it, do you feel like it is hopeless and you are already losing? 1 Samuel 17:16 – For forty days the Philistine came forward every morning and evening and took his stand. 1 Samuel 17:24 – Whenever the Israelites saw the man, they all fled from him in great fear. For more than one month, the Israelites had to face the same fear every day. They can’t do anything except to be terrified and ran away from Goliath. Have you been in the same situation, you can hardly sleep and doesn’t want to wake up the next morning because of great fear and worries? What was their focus why the Israelites were in great fear? To whom were they depending for strength and victory? This is the same question we can ask ourselves every time we encounter problems and challenges in life. If we let fear get into our mind, we will be paralyzed just like the Israelites. We can’t think and act out properly to overcome our problems. We just keep running away. How can you FACE your GOLIATHS? During this battle, David was not in the battle field. He was taking care of their flock when his father, Jesse asked him to bring food to his brothers in the army. When David saw Goliath, you can never see any trace of fear in him. He knew who God is and what God can do for the Israelites. His brother could have thought of him as conceited and wicked, but David was not focused on himself. However, this is a reminder for us. Sometimes, we get so conceited and be full of pride that we feel we don’t need help from anyone especially from God. We think we can do it on our own, when the truth is we could not. We need to have the right mindset and attitude as we face the giants in our lives. To face your goliaths in life, you must first overcome fear. How? Change your focus. Focus on God and not on yourself. David faced Goliath with confidence in God. What can a little boy really do against a giant? But God was with him. How do you PREPARE for your battles? Sometimes, we wonder why we need to do certain things in our life. For example, you were sent for training by your manager and you feel at that moment that the training has no relevance to your current work. You might even think that it would just be a waste of time. Months passed, an opportunity opened for you because of that training you went through. David, before he became a king, he was a shepherd boy. If David will have an option, he would have preferred to immediately become a king. However, God sees the bigger picture. 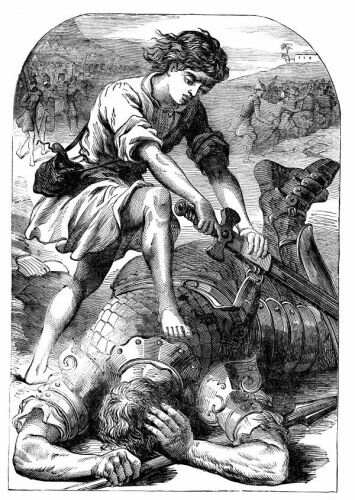 David had to go through a lot of training as he would be fighting not just a giant when he becomes a king. God prepared David through lion and bear to fight Goliath. Just like David, God never let us face trials in life without preparing us. He will always enable us to handle relationship, career, financial, health problems, etc. as long as we put our trust in Him and continue to depend on Him. Then Saul dressed David in his own tunic. He put a coat of armor on him and a bronze helmet on his head. David fastened on his sword over the tunic and tried walking around, because he was not used to them. “I cannot go in these,” he said to Saul, “because I am not used to them.” So he took them off. They say that if there’s an easier way, why go through the trouble of doing things the hard way? Nothing is wrong with the easy way as long as it does not compromise the right values you believe in. This world can offer us a lot of options to solve our problems but if it is not right with God, we should learn to say “No.” Trust that God’s way is always the best way. Our actions will always have bad consequences if we do things that compromise our walk with God. David would have fell down even before Goliath hits him with the armor that was put on him. Even before he fought, he could have been defeated already. This goes the same with how we handle our trials with compromises. How are you USING what is ENTRUSTED to you? If there’s one of the many things that David was good at, it was using a slingshot. God has entrusted us with so many things that we fail to use them properly and wisely – treasure, time, talents/skills, relationships, influence, intellect, wisdom. How have we been maximizing these when we face our own trials in life? As God enables us to fight battles, He also equips us. We need to do our own part just like David as he slung that stone and struck Goliath’s forehead. The rest, we leave it to God. God will be the one that will make our trials fall, face down on the ground just like what He did to Goliath. Have you been using your own slingshot? Or, are you so focused on what you don’t have thinking that could help you solve your problems? Who’s battle, yours or GOD’s? The most important thing that we have to remember, our battles are not our own. When we face each battle, God is going before us, fighting for us. Our battle is also His battle. We are not alone as long as we let God fight for us. David trusted that God will bring down Goliath with just a mere stone. After all, what can really a stone do to a giant? It could just be like a poke to him. How David responded was very different on how the Israelites army did. David knew that it was also God’s battle. The Israelites thought it was a battle they have to fight on their own. How have you been facing your problems and trials in life? Have you ever let God face it for you? There was a time when our family had a lot of debt to pay. My father had less than a year then he will have no work anymore. I was thinking how we can continue to pay our debts. God impressed to me to pray for an onshore assignment in Canada. I was thinking at that time that would really help us in our financial need. However, I did not know if there would be a possible opportunity. But still, I prayed. And indeed, God made it happen. There were fears that it might be cancelled but then I told God that time that if it was His will for me to go, nothing will hinder His plan for me. And so, I just let God took care of things that were beyond my control. God does not want us to feel defeated. The moment we believed what Jesus did for us and accepted Him in our life, we have become more than conquerors. We have become victors because Jesus has overcome the greatest battle and that is to be eternally separated from God. These battles that we have now are momentary battles only. There is nothing that God can’t win for us when He already won the greatest battle for us through the death and resurrection of Jesus. Today, I pray that you would face your trials and problems in life like David. Do your part but focus on what God can do and not on what you can or can’t. You can say this prayer as you face your battles in life. Thank you for giving me the strength to face each day no matter how hard it could get. I ask that you continue to sustain me that I will never give up. Help me to always focus on You and not on my own strength. Remind me always how great, good and powerful You are that there is nothing or no one that can defeat You. I entrust to you my trials knowing that there is nothing You can’t handle. Thank you for the hope and the peace that overcomes my fears and worries. This I pray in Jesus’ Name, Amen.